The ACT Government is investigating whether the housing needs of the Canberra community are currently being met and how they can be better met in the future. The engagement process for the Housing Choices project involved multiple stages. The first stage was the release of a discussion paper. Community members provided feedback on this paper through workshops, submissions, an online survey and drop-in kiosks. 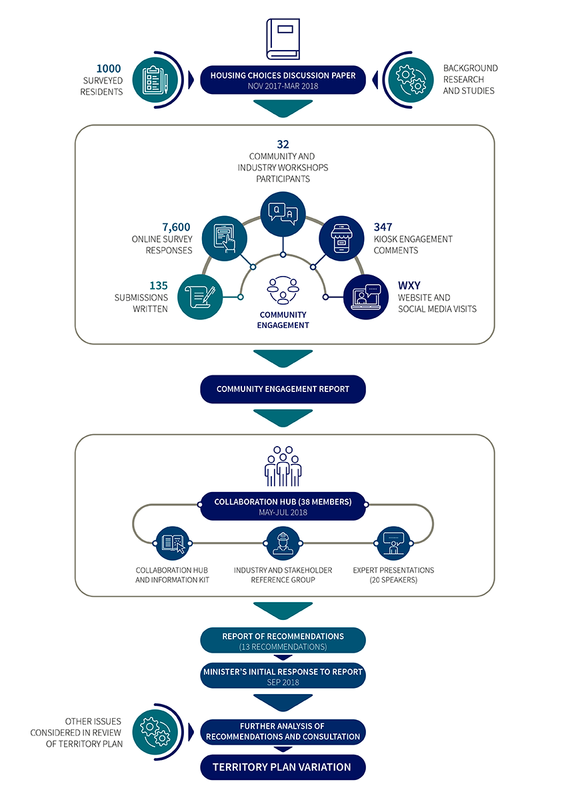 The outcome of this engagement was provided to the Collaboration Hub, a randomly selected group of 38 individuals that represented a broad cross-section of the Canberra community. The Collaboration Hub was a deliberative process that brought together these citizens to discuss, deliberate and receive information on housing choices. The outcome was a report of 13 recommendations for housing choices in Canberra that was presented to the Minister for Planning and Land Management in July 2018. The Housing Choices project looked at how we can better meet the housing needs of our residents. It aimed to bring together a broad range of ideas and opinions to reach a consensus that would guide the future planning of our city. The ACT Government has agreed in-principle to all of the Collaboration Hub recommendations. Further detailed work has started to determine the most appropriate way to deliver each recommendation, for example, planning changes may be dealt with through a variation to the Territory Plan. Members of the Collaboration Hub and Stakeholder Reference Group have been invited to work with planning staff to develop the implementation of recommendations 5,7 and 12, which involve: introducing mandatory standards for proportion of soft landscaping and plantable area in RZ3 to RZ5; increasing the mix of dwelling sizes and housing types in all residential zones; and allowing dual occupancy developments with separate title in RZ1. A review of the Territory Plan will begin in 2019 and will further build on implementing the Collaboration Hub recommendations. A community engagement process will also be undertaken as part of the Territory Plan review. The Collaboration Hub launched on Saturday 5 May 2018. It explored issues such as what zoning should allow, what provisions and principles do Canberra’s agree as important to deliver the housing we want and plan for future needs. To find out more about the issues, challenges and solutions the Collaboration Hub explored, take a look at the the Information Kit that was provided to all participants prior to the first meeting. Invitations were sent in March to a random sample of approximately 15,000 residents. These were sent to physical addresses so as to not discriminate between those who own or rent their property. Recruitment and selection has been managed by newDemocracy Foundation independently from Government. The Collaboration Hub Process Design provides further detail. Canberra is changing – and there are many different ways our housing needs can be met. The final session of the Housing Choices Collaboration Hub was held on Saturday 28 July 2018. The final day involved a range of activities where participants finalised their recommendations for the report. After lunch, a closed session was held with participants around the Demonstration Housing selection criteria. Due to the confidential nature of the content, observers were asked to step out during this activity. Mick Gentleman MLA, Minister for Planning and Land Management was presented with the final recommendations report. In September 2018, the ACT Government agreed in-principle to the 13 recommendations on housing choices provided by the Collaboration Hub deliberative democracy process. View the Government response here. Unfortunately the following representatives were unable to be with us on the day but joined us via Skype during the question and answer sessions to talk directly with participants. Thank you to all our presenters on the day. If you would like to hear what they had to say, links to the presentations are provided below. Participants again heard from a range of industry and government representatives. If you would like to hear what they had to say, links to the presentations are provided below. options for public and affordable housing. Why do we need more housing choice? How has the discussion paper been developed? What did the background research find? Why do we need a more compact city? How might the Government encourage more housing choice and diversity? If there is broad support for some of the proposed changes raised during the community consultation, what happens next? How will the government ensure the views of the broader community are considered? There are a number of social and environmental drivers that are influencing the need for greater housing choice in Canberra. Canberra’s population is growing and will continue to grow. It is also one of the fastest ageing capital cities in Australia. The structure of our households is changing. The number of families with children has fallen and the number of couples with no children and single persons living alone has dramatically increased. These changes create different requirements for the size and adaptability of our dwellings. Canberrans have one of the largest ecological footprints in the world. A more compact city can help to reduce our ecological footprint. Canberra residents value the look and amenity of their neighbourhoods. However, they have also indicated they want change. Over 50% of Canberrans want to remain living in their communities as they age. This increases to over 75% in people aged over 65 years. Many residents have indicated there isn’t housing available for them to downsize from their existing homes. These concerns are reflected in the decline in neighbourhood satisfaction over the past decade. Overall neighbourhood satisfaction has decreased from 99% to 82% since 2004. Almost 10% of Canberrans are less satisfied with the range of housing types in their neighbourhood – currently 59.4% are satisfied, compared with 69% in 2004. Canberra residents have indicated they want more choice in housing other than single dwellings and high rise apartments. Over 50% of people want to see more dual occupancies in suburban areas. Over a third of people think there should be more townhouses. The ACT Government is committed to developing a sustainable, compact and well-connected city. Consistent with the 2012 ACT Planning Strategy, our focus to date has been urban intensification in town centres, around group centres and along the major public transport routes. We know the community wants housing choice and housing affordability addressed. Encouraging a range of housing choices in the suburbs helps younger people buy their first home and assists older people to down-size and remain living in their communities and neighbourhoods as they age. Limiting our urban footprint is particularly important to protect our limited land resources for biodiversity and recreation and retain the bush capital character of our city. Innovative and compact design, liveable neighbourhoods with great place-making, viable services and efficient transport infrastructure provide a greater lifestyle choice for Canberra’s changing demographics and household structures. In a growing, more compact city better public transport and path systems provide more travel choices and encourage people to walk and cycle as viable, healthy transport options. Whilst some potential future changes to the planning system and housing policies and codes, if adopted, could lead to more compact urban development, we need to ensure Canberra residents have choice in housing now and into the future. The community has expressed a desire for more housing choice and flexible housing forms in their neighbourhoods and suburbs – not just single dwellings or high rise apartments. The community wants more housing in the ‘missing middle’ range – with medium rise and medium density housing types such as dual occupancies, villas, terrace houses and townhouses. The Government is able to encourage housing choice by simplifying the planning system so building a range of housing types is easier. Consideration can be given to making changes to plot ratios and block densities in the residential zones, which will also encourage different types of housing in our communities. The Housing Choices Discussion Paper will be released for community consultation from 13 November 2017 until 9 March 2018. Following the consultation period, I will be briefed on potential future changes that have been raised and have the support of community and industry. Any proposed future changes to the Territory Plan or planning system will undergo additional analysis and community consultation in the usual way. The Housing Choices Discussion Paper was informed by research, community feedback and a statistically significant survey of over 1000 residents, which includes the views of younger working families, single people and couples. The community engagement period on the discussion paper has been designed to ensure everyone has an opportunity to express their views. During the engagement period, EPSDD will run café conversations and workshops and use online tools to ensure that a wide range of people can participate and have an opportunity to comment. The ACT Government has agreed in-principle to all the recommendations from the Housing Choices Collaboration Hub. This report provides the full government response to each of the 13 recommendations. Further analysis and consultation is being undertaken to prepare a draft variation for the Territory Plan. The variation will address the Collaboration Hub recommendations 5, 7 and 12. which involve: introducing mandatory standards for proportion of soft landscaping and plantable area in RZ3 to RZ5; increasing the mix of dwelling sizes and housing types in all residential zones; and allowing dual occupancy developments with separate title in RZ1. The Demonstration Housing project is now underway. Successful applicants will be announced in early 2019. Read more information about the Demonstration Housing project. A review of the Territory Plan will be undertaken in 2019 and will involve further analysis and implementation of the recommendations made by the Collaboration Hub members.